First Line: Father Tudor Harcourt had a problem. The worst kind of case on which Detective Inspector Charlie Priest can work? Anything involving children, and that's just what's been dumped right in his lap. The eight-year-old daughter of local businessman Miles Dewhurst has gone missing, and it's as if she's vanished in a puff of smoke. Priest and his team fear the worst. Charlie's suspicions focus on Dewhurst himself, but until they uncover more evidence nothing can really be done except to continue to look for the little girl. Not that Charlie has time on his hands to begin with, since local clergymen are dropping like flies. The most recent victim had a picture of a mushroom left beside his body, and the press quickly dubs the killer "The Mushroom Man." It seems like something more than coincidence ties the clergymen together, but until Priest and his team can get their first lead, they all feel as though they're merely spinning their wheels. Is it any wonder that Charlie wishes he had time to spend courting Annabelle, a luscious bishop's widow? I've been spending some time this summer picking up where I left off with several mystery series that I've enjoyed in the past. 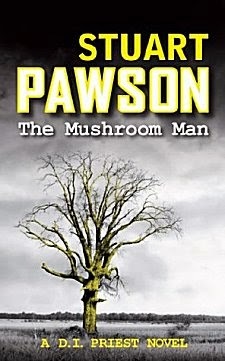 After reading The Mushroom Man, the second book in Pawson's Charlie Priest series set in Yorkshire, I tried to remember how long it had been since I'd read the first, The Picasso Scam. Five years, that's how long. I can't believe it, especially since I clearly remember enjoying that first book so much. After falling under Charlie's spell every bit as deeply as I did the first time, I'm going to have to make sure another five years does not go by before I read the third. Stuart Pawson writes excellent mysteries! The two separate investigations are both very strong. Many writers would have chosen to separate them into two books, but Pawson knows what he's doing. Oh boy, does he know. In some ways it almost feels as if he's teasing readers because clear clues are provided all along the way. All we have to do is see them for what they are. Both cases do not focus on the actual crimes, and I was grateful for that, especially in the case of the missing child. No, the focus in both is on the investigation itself and in showing how patient, dogged footwork-- and a tiny dash of intuition-- can bring a murderer to justice. Charlie Priest himself is a marvelous character, and one of my favorites. He went to art school, wears artsy fartsy ties, and doesn't particularly care for high brow music. He has a great relationship with his team, partly because he's always out there working with them and partly because they know exactly what he expects from each and every one of them. With two such engrossing cases for readers to attempt to solve, his bumbling efforts to show Annabelle Wilberforce how much he is growing to care for her are a welcome-- and endearing-- respite. How did I fare in deducing the killers? One out of two. I was laser-sharp at spotting the very first clue Pawson planted for the missing child, but I was a dismal failure in the second investigation. In fact, when I learned why the clergymen had been targeted, the answer was so blindingly obvious that I could have slapped myself upside the head. Having this much fun reading a mystery should be illegal. Since it's not-- and before anyone in authority changes that-- I'd better move on to the next Charlie Priest novel! I love that series. One of my absolute favourites! I can't wait to continue reading. Charlie Priest is a treat.